I admit it. I am always birding. Even when I wake up in the morning I lay in bed indentifying the birds I am hearing outside. Even in the middle of white-water rafting I am still birding. A couple of my old neighbors from Star, Idaho invited me to go rafting with them this morning on the South Fork of the Payette. It is about an 8 mile ride down to Banks, Idaho. The folks at Idaho Whitewater Unlimited showed us a good and safe time. Those Staircase rapids are pretty intense! I didn't have my binoculars on me so I couldn't identify every bird I saw but there were dozens of Spotted Sandpipers bobbing their tails along the edge of the river. 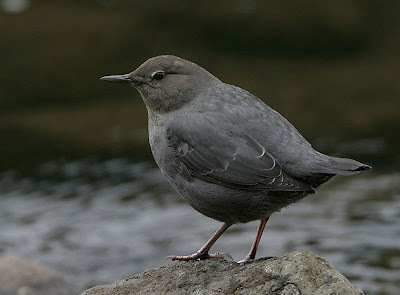 There were a couple of American Dippers along the way which are always fun to see. Common Mergansers sitting on a rock in the middle of the river and a good number of Cedar Waxwings flycatching right over our heads. It was fun to teach the river guides a little about the birds along the river and maybe they'll remember a few of the names I taught them and share them with their future guests.